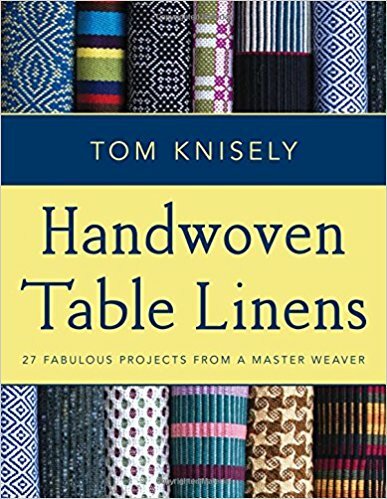 Win a copy of Tom Knisely’s latest book, Handwoven Table Linens! Do you need some holiday gift inspiration? Whether you are a weaver making gifts, or have a weaver on your gift list, Tom’s latest book is here to help. For weavers, Handwoven Table Linens is like a sampler of different weave structures. Twenty-seven projects in 4- and 8-shafts encompass techniques such as summer and winter, false satin, overshot, shadow weave, canvas weave and Quigley. For intermediate and experienced weavers who prefer to learn by doing, they provide a simple way to try new things. Anyone weaving for a holiday table will like the Finnish Trees place mats, with their subtle, abstract pine border. Other projects include table runners, napkins, a tablecloth, and mug rugs–everything you need to dress a bare table. Tom points out that, by choosing colors and patterns that complement the dishes on the table, you can create one-of-a-kind, personalized textiles that are exactly right for the people on your gift-giving list! As always, Kathleen Eckhaus really delivers on the photographs. Clear, beautifully staged project photos include at least one close-up of each piece, showing both front and back when relevant. Additional photos, such as the one found on the title page, create an inviting and homey atmosphere in which to peruse this book. One lucky winner will receive a free copy of Handwoven Table Linens! (Courtesy of Stackpole Books, the publisher.) To enter, comment on this post (click on ‘comments’ in the small blue menu at the top of the page) with the type of table linen you would like to make (or receive) next (i.e. place mats, table runner). I have put the first comment in to get the ball rolling (although I am, of course, not part of the contest). Entries will be accepted until midnight on Wednesday, December 13, 2017. The winner will be randomly selected and announced on this site. Good luck! A set of summer and winter placemats. I would love to make placemats with a technique that I have yet to try. I have a 4s6t Harrisville loom that I love!! I don’t know very much about weaving, but I love beautiful textiles and holiday decorations. As a retiree, I have the luxury of time, and interest in learning new things.. It is embarrassing to be a weaver and not have a decent table runner. I really need to make one! I would love to weave some for next years gifts, yeah that sure is a great idea…. The placemats I wove about 18 years ago now need to be replaced, but I’m not sure what pattern to use. This book would be a great help! I am a newer weaver, but would love to weave some runners, more geometric, for my son. I am fairly new to weaving so I would love to be confident enough to weave anything in Mr. Knisely’s book! All the patterns are lovely, and I’d especially like to try the Shadow Weave. I have been wanting to weave a set of placemats and matching napkins for my dining room table for quite a while now. Life keeps getting in the way and has kept me from weaving for most of the year. I’m hoping once things settle down at some point, this project will be the next one to go on my loom. I would weave a set of table linen to reflect the spring landscape from where i live in Teesdale UK, i am influenced by the sheep, dry stone walls, rough moorland landscape and signs of daffodils springing to life at this time of year, everything begins to wake up and the colours begin to come through from natural shades of browns and greens for months to hints of yellow and gold with multiple colours shown in the tulips. that would reflect lovely in the table linen. Someday I’ll weave a fine linen tablecloth. I’ve done the sampling, but still waiting on time to do the actual project. I would love to make an entire set: placemats, runner and napkins, for a Thanksgiving table. I’ll probably start with the table runner though. I would like to weave a linen tablecloth—that is, after I get the warp on the loom for the napkins that match the previous tablecloth I wove. I would like to make a whole matching set…for my mom who loves to set a pretty table and can’t seem to find a tablecloth in the right size! In linen…that would be lovely. Tablecloth, runner, placemats and napkins! I would like to make some rep weave placemats and napkins to match – all in colours that won’t show the stains when I host my big curry dinners! I really like to use cloth napkins. Guess I should make some! The idea of weaving my own table linens for Christmas is divine! I would like to read your book and have it at hand. Napkins, table runner and place mats. I would like to weave placemats and napkins to match. I think I would like to make an Overshot Table Runner next. I want to make a set of rep weave Red and Green Christmas placemats with a coordinating set of red and green log cabin napkins. New placemats! I’m using the ones I wove for my mother almost 30 years ago. I’d really like to weave a linen damask table cloth for myself (and whomever inherits that table). The problem is that the tablecloths for that table must be 60″ wide and I have a 48″ loom. Piece it? Double weave it? Get a new loom? Hmmm. I would want to weave that as one piece without doubleweave, if I was doing it. But that would be an extremely wide loom! Do you know anyone near you who would rent you some time on a 6-foot loom? I have considered that for a queen-sized bedspread. Napkins are next in my list, though I’d love to weave a tablecloth someday! I’d like to make a rep table runner, I think! I would definitely weave the holiday Place mats (for next year!). Been wanting to do that type of project for a while. I will weave more napkins. Woven napkins are so much nicer than the paper ones! I could not agree more–nicer and less wasteful! I also use the bits of warp at the end of a run of towels to make napkins. It uses up the warp instead of wasting it when there isn’t enough for another towel, and you get a drawer-full of interesting everyday napkins! Table runner and placemats! I’ve never tried those before, and would love to see how they work out. How pretty. This would be so much fun and I would be so proud to be able to make a nice table runner. Thank you. I love using cloth napkins at dinner. I need to weave some for Christmas. I would like to weave a table runner in spring or summer colors. I have several but they are either holiday colors or autumn tones. A table runner in warm colors to brighten the winter days. I would like to make placemats with matching napkins. I want to weave a table runner in overshot using Christmas-y colors. I would like to make a table runner with coordinating placemats. I would love to make some placemats! Can you believe I’ve never owned placemats?! I’m planning a set of rustic placemats and napkins from organic cotton and linen. I think I would like a tablecloth to use with burgundy table runners I finished this fall. I might make it twice as long as usual for when we host Boxing Day Open House and two dining tables get pushed together. I hope my next table linen is a full-sized table cloth for my dining room table. I anticipate a new-to-me loom arriving some day soon (a big Swedish CM), and so once I get that figured out, I should be able to weave fabric of the appropriate size. I would love a copy of Tom’s book. I’, warping my loom for placmats. Would love to wn a table cloth or runner. I’m winding a warp for a color-and-weave runner, kind of a modified log cabin. Next on my weaving list is a holiday table runner. I’m not sure I’m going to get it done for this year’s Christmas – but hopefully if I start planning now I’ll get it finished for next year 🙂 ! I could use both placemats and a new table runner. I just realized the other day how really worn out what I do have is. i would love to make a tablecloth and matching napkins. I would like my next table linens project to be…a new table runner to match the new color scheme in my living room. And I probably won’t even make it from rags (sshhhh). I would like to make some table mats, in a weaving technique I haven’t tried before. Maybe repp?